This time, the KDE release team was pretty quick with their KDE 4.7.2 source tarballs. Normally, distro packagers get a few days of headstart so that they can create packages in time for the source release, but this time I was not yet ready compiling. Anyway, here they are, myKDE 4.7.2 packages for Slackware. I guess all of you are used to the modularized KDE. Read my post about KDE 4.7.0 if you want to know more about the reasons for splitting KDE for Slackware into many more (and smaller) packages. Read the accompanying README file for installation and upgrade instructions! There are several updated dependencies compared to Slackware’s own KDE 4.5.5: PyQt, QScintilla, akonadi, attica, clucene, ebook-tools, hunspell, libdbusmenu-qt, phonon, polkit-qt-1, qt, raptor2, rascal, redland, shared-desktop-ontologies, sip, soprano, strigi, system-config-printer and virtuoso-ose. In comparison with my previous 4.7.1 there are only two updated dependencies: libbluedevil and strigi. The upgrade of Qt to 4.7.4 which I did for the previous 4.7.1 package set added stability to the 4.7 series. I wish I had added an up-to-date Qt4 when I released 4.7.0 packages because I was quite unhappy with the desktop experience back then. However the new Qt4 package deals with the false SSL certificates issued after the CA authority DigiNotar got hacked which is another good thing to have. KDE dpendencies that are not part of Slackware 13.37 at all (yet): grantlee, herqq, libatasmart, libbluedevil, libssh, phonon-gstreamer, phonon-xine, sg3_utils and udisks. Note that I added phonon-gstreamer and phonon-xine only after I had already released KDE 4.7.0 packages because people reported that they no longer had sound. These two packages solve that issue. You will find three useful new applications, compared to Slackware’s own version of KDE: I already added bluedevil to my 4.6.5 package-set. Bluedevil is the new KDE bluetooth stack with a nice GUI, based on the BlueZ libraries already present in Slackware. And with KDE 4.7.0, I included kplayer, a KDE front-end to MPlayer. 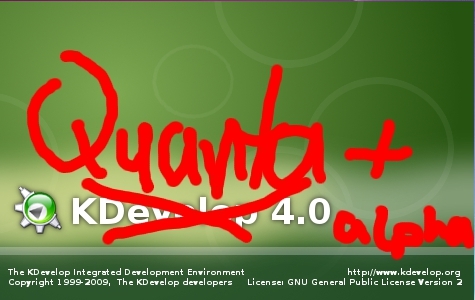 This time, I added Quanta Plus, which disappeared from KDE4 because that migrated from Qt3 to Qt4. It is now being worked on again, but no longer as a standalone application – instead it is available as a plugin to the Kdevelop Platform. I also added oxygen-gtk, which is not really an application, but a theme engine. It (optionally) makes GTK applications visually blend in with KDE’s own Oxygen theme. There is a README in its documentation directory which explains how to enable it. Posted: 5 October, 2011 in Slackware, Software. Works great! Another piece of hard work done superbly! Thank You Eric! As usual, thank you very much to you and KDE Team. Guys, i’ve got a question – since KDE 4.7.1 when i boot into Slackware (KDE) at start i have: kde deamon stopped responding. Do you know why it appears? There is something more: Eric in readme write what to remove using removepkg but in my Slackware i don’t have it (i checked with pkgtool) – is it ok? I’ve been using Alien’s KDE 4.7.1 under Slack 13.37 64 bit without any issues. Has anybody tried 4.7.2 under slack 13.37 64 bit? Is it ok? Thank you! There are almost no differences in the dependencies between KDE 4.7.1 and 4.7.2, and I have several reports that KDE 4.7.1 packages work well on Slackware 13.37. So, I think that my KDE 4.7.2 packages will work just as well on Slackware 13.37. Thank you Alien. I have just upgraded KDE and it is working perfectly, as always. Thank you again for your fine work! Hi, Eric, I got this problem: “Maximum number of clients reached” after upgrading to 4.7.2 (current updates on your repository). No problem when using 4.7.1. Do you have an idea how to solve it? Is it KDE-4.7.2 bug? Please check if you still have the “guidance-power-manager” package installed and if so, remove that package. Hi Eric, I have removed it since KDE-4.6.3 because of same problem. I have downgraded to 4.7.1 but getting worse, I could not open any single file. Downgraded to 4.6.5, as well 4.5.5, was not helpful. However, after I cleaned up all config files, cache, etc. related to KDE in home dir, KDE-4.5.5 was running well. Trying to upgrade directly to 4.7.2, it works! Now, KDE-4.7.2 is running smoothly on my laptop after copying the important, old config files, replacing the new ones. It’s confusing. I suspect that my old, own compilation of gtk-kde4 0.9.5b may crash, because when this problem occurred, many processes of gtk-kde4 were running on system. But, I’m still not sure. I’m using them on slackware 13.37 without disturbing problems so far. I don’t use all the KDE programs, but at least those I’m using work fine. Thanks a lot Eric, been using your packages all the time I’ve been using Slackware. They help to make it great distro as I don’t need to do everything I can’t handle by myself yet. Hi Eric. The only problem I am facing now is that ALT+F2 is not working – it doesn’t launch anymore. I went from 4.7.1 to 4.7.2. SHould I remove my old config files? How? Thank you! Eric, thanks a BIG BUNCH for your work on this! Runs perfectly on Slackware 13.37, Nvidia prop drivers and kernel 3.0.3. The program which is started with Alt-F2 is “krunner”. Try starting “krunner” from a terminal command prompt and see what happens. If there are any error messages (in my terminal the command remains silent and just starts correctly) they may be helpful in determining the cause. I would not know of any config files to delete in order to fix this. Thanks Eric. When I lauch krunner from konsole it throws a lot of data on the screen mostly about AKONADI and Nepomuk; I don’t know why. Additionally, ALT+TAB, which I use to change screens, is not working anymore after the upgrade. The only thing I have done after upgrading was to stop AKONADI/NEPOMUK, which I always do. I assume you only disabled akonadi and nepomuk and did not remove the packages containing those? Yes, Eric. Now I reactivated Akonadi/Nepomuk and all went normal. If I don’t want to use akonadi/nepomuk should I remove these packages? Are they integrated with krunner? Thank you Eric! It is all back to normal! I just upgraded to 4.7.2 on 13.37 and all is well. Thanks again! Eric, i have a question. I’ve removed all of kde 4.7.2 packages and went to 4.6.5 but when i started it i had: kdestartupconfig4 doesen’t exist or fail. Do you know why? I tried to install 4.5.5 form Slack DVD and i couldn’t even from sources. I had to reinstall 4.7.2 in order to have KDE again, and graphical gui. I though that when i completly remove Your packages i could install everything older. It is possible to uninstall all of my packages and re-install all of the standard Slackware packages. Remember that you also might have to re-install the “dependencies” packages for which I offer newer versions than Slackware, and there is also that single package you had to remove in order to use my own KDE: “polkit-kde-1”. And another cause for issues can be that the newer KDE versions create or update configuration files in ~/.kde and ~/.local that are incompatible with the older KDE 4.5.5. Try renaming (not deleting) your ~/.kde directory and see if that will allow KDE 4.5.5 to start. Thanks for an advice. I didn’t know this tip with renaming ~/.kde (but of course when i uninstalled KDE 4.7.2 i also uninstalled dependancies for it and after that i installed KDE and dependancies from 4.5.5 – strange thing, i tried to install from source with slack script on dvd but i couldn’t because something was missing. I will try with renaming another time – thank You. I just wanted to try removeing newer version and bring back older because i was curious. It seems that I have a problem with Okular opening .pdf files. Okular complains that it is unable to open the file, and it says it can’t find a plugin able to handle the document. I fixed it – It was simply renaming .kde and starting over..
I’ve got question. I’ve removed ~/.kde because i had few errors after upgrading to 4.7.2 – now i don’t have errors but Dolphin runs only from terminal windows. I don’t have it in K, when i start it from main window of K nothing happens. Also, if i try to add dolphin icon on taskbar there is only withe icon – tried to run it and i’ve message: “kdeinit could not run dolphin-icon, could not find dolphin-icon executable” Can You guys help me? I can only start Dolphin file menager from terminal. I forgot to mention – after deleting ~/.kde i setted up my system, now i have new ~/.kde but with it Dolphin doesen;t start from K – i tried to delete this new ~/.kde but with newest, all is the same – can’t start it, only works from terminal. I now that dolphin is in kdebase, i’ve reinstalled it but it didn;t help. Here in Slackware land, krunner keeps working nicely when using the Air Netbook theme… perhaps it is time for you to ditch Kubuntu and switch to Slackware?